What is a saltwater chlorinator? Does my pool require a salt water chlorinator? What is the best salt water chlorinator? How do I choose the most effective salt water chlorinator? A saltwater chlorinator is a device that uses the normal table salt (sodium chloride) as the primary ingredient to produce chlorine. The chlorine is then used to clean and sanitize your swimming pool. Therefore, you need the best salt water chlorinator for your pool and this is how you can get it. Not all saltwater chlorine systems are the same. Some are better than others. Also, what might work for one person might not work for you. Hence, you need to have the answers to these questions before you head out to the market to get your chlorinator. What type of a pool do I own? You will need either a chlorinator for above ground pools or in-ground pools. Some are designed to fit both types of facilities. What is the size of my pool? You should know the amount of water your swimming pool holds. This will help you to make a decision on the best chlorinator for your size facility. A huge pool will require more chlorine than a medium or small one. 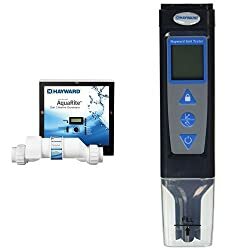 What is the best brand of saltwater chlorinator? As we said, some chlorinators are simply better than others. They might be more expensive but worth your money in the long-run. What kind of warranty do I want? Most chlorinator models will come with a warranty. However, some will come with an extended warranty. Do I need additional features? First, you should ensure that your chlorinator has all the must-have features of a good chlorinator. Then, look for additional features that make it the best device. Do I want to redo my plumbing system? If you don’t want to redo your lines, you need to get a unit that will fit the existing system. What is my budget? Always ensure that you buy a device that you can afford. Plan your budget before you start to look for a chlorinator. They maintain your pool automatically. They reduce the amount of chlorine in your pool. They reduce the amount of salt in your pool. They produce skin and eye-friendly chlorine. These devices also have some disadvantages such as high operating cost and expensive to install. However, their benefits are much more than the shortcoming. Salt water chlorinator also saves you time and money for buying expensive traditional chlorine. 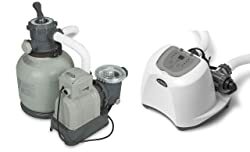 Here is a review of the top 12 saltwater chlorinators on the market today. 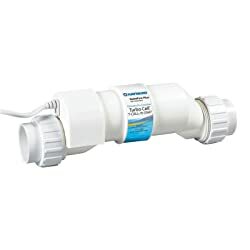 The Pentair 520554 IntelliChlor IC20 uses ordinary table salt to provide all the chlorine your pool requires, automatically, effectively, and safely. It provides the same level of sanitation of a manual chlorine device but without the shortcoming of a manual chlorinator. With this gadget, you don’t need to purchase, carry, and store chlorine elements. The product is also able to diagnose its capability, including the remaining cell life that shows the number of hours it will operate before it runs out of juice. It is also able to collect performance data every day and supports a 40K gallons pool. 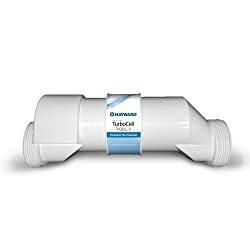 If you are looking for a device that will add chlorine to your swimming pool effectively, then you cannot go wrong with Hayward T-Cell-3 TurboCel Bundle. The product comes with the Hayward GLX-CELLSTAND Cleaning Stand Replacement that is also compatible with all Hayward Turbo Cells. This particular chlorinator is made for a swimming pool of up to 15K gallons of water. The device produces chlorine from the normal table salt to ensure that your pool is well treated. With this device, you will not only save time that you would have waste when buying chlorine but also money. 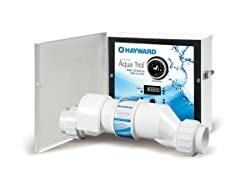 Common in most new swimming pools, the Hayward AQR3 is an effective alternative to traditional models. This model is NSF certified and works with the existing filtration and pump systems to constantly supply your pool with chlorine. The gadget uses a low salt level to make your pool silky soft and provide the best swimming experience. It effectively sanitizes your pool by turning table salt into pure chlorine. It is designed for pools of up to 15K gallons and features a digital control unit that provides both salt display and 8 diagnostic indicators. Unlike the traditional chlorine treatment system that requires a regular routine of inspection, the Goldine automatically generates chlorine from table salt. Perfect for above ground pools, the product provides your pool with the purification it desires. The unit comes with an easy to comprehended digital display with seven diagnostic indicators for smoother operation. Additionally, the unit ensures that you get silky smooth water and is recommended for a pool of up to 18K gallons. The chlorinator also has a 24 hours timer that controls the pump and filter operation. 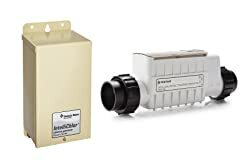 Together with the Pentair IntelliChlor IC20, this is only one of few of chlorinators on the market today that can handle a 40K gallons pool effectively. 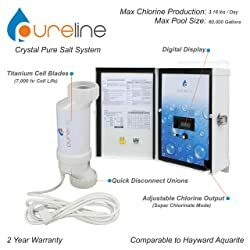 The product has a good reputation among users due to its ability to turn table salt into chlorine quickly. This ensures that you get a bacteria-free pool which is ready for use around the clock. In fact, its output feature cannot be matched by other models on the market today. Another great feature of this unit is the 2 salt sensors that constantly monitor the salt level. 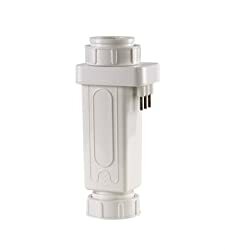 This is a compatible replacement salt cell for all the AutoPilot Pool Pilot salt generators. The cell comes with three terminals but you only need to use two since your pool has already a built-in sensor (3rd terminal). Also, the unit aligns well with the holes with the 2 terminals, making it easy to install. Just like most products in our list, the chlorinator ensures that your pool is well sanitized by providing chlorine from pure table salt. The unit supports a swimming pool of up to 35K gallons and comes with a sensor. The best way to sanitize your swimming pool is to use an effective salt water chlorinator. That precisely what you get with the SwimPure Plus Salt System. It produces a less-irritating and safer than normal chlorine, ensuring that you take a dive anytime you want. It produces specialized chlorine ions that sanitize your facility and it is able to recycle the salt. Hence, your table salt will never wear out. The product is recommended for a huge pool of up to 40K gallons. This salt chlorinator uses your table salt to provide all the chlorine you need to effectively sanitize your pool. Its chlorine is usually friendly to the skin and eyes and saves you money since you don’t need to readymade chlorine. The unit features a shut-off feature that protects it and prolongs its life when the water is low. It also prevents calcium build-up and is certified to be safe. Furthermore, it collects performance data like chlorine output, hours of operation, salt readings, water temperature, and production settings. The chlorinator is ideal for a pool of up to 40K gallons. The best part, you can program the display to show in at least six languages, including French, English, and Spanish. The product maintains a high flow rate and comes with a 2 years warranty. It also features an in-line strainer that protects the tri-sensor as well as the cell from dirt. This chlorinator provides a lot of benefits not found in the diatomaceous earth and cartridge filters. The product lasts for at least 5 years, ensuring that you don’t visit the market to get a new model any time soon. It also keeps your pool water soft, refreshing, and clean, thanks to its ability to convert table salt into chlorine. The unit comes with 2-stage technology that spills water molecules in order to kill algae and bacteria. The unit is recommended for a 15K gallons swimming pool. The SmarterSpa Chlorinator generates only what is required to sanitize your pool, thanks to the MegaChlor technology. The device also reduces the time you spend cleaning it due to the self-cleaning mechanism. With a plug-and-play system, it is very easy to install and use this gadget. Just attach it and lower it into the water and it will do the rest. The product is able to produce up to 30 grams of chlorine from table salt per day and supports up to 1K gallons of water. Crystal Pure Pool Salt System features a durable design that ensures you get years of services from this unit. It also boasts of large chlorine capacity to make sure that your entire pool is sanitized around the clock. Another great feature of this gadget is the super chlorination mode that adds to its efficiency. It also comes with adjustable settings that enable you to set the ideal amount of chlorine output. With a 2 years warranty, you can be assured of getting value for your money when you get this chlorinator and is ideal for a 20K gallons pool. The work of a saltwater chlorinator is to clean and sanitize your pool. It helps with cleaning your pool by producing chlorine from the normal table salt. All you need to do is to load your device with table salt and it will produce the chlorine you need. The device produces the chlorine from a salt cell which houses the electrical plates. When you power the chlorinator, the electrical charge passes through the plates as well as the salt water. That’s when the chlorine is produced and then released into your pool. The best thing about this chlorine is that it is better and safer. It doesn’t have any element that can make the water smell bad. This is also because it is in minimal amount; just what your pool needs. Since it produces the chlorine from the salt, you don’t need to purchase the chlorine, carry it, and store it at home. You don’t need to deal with harmful chemicals when there is an easier way to sanitize your swimming pool. A: It is a system that turns table salt into chlorine. It doesn’t use traditional chlorine to clean your pool. Q: How much salt does my pool require? A: This will depend on two factors: the type of chlorinator you have and the size of your swimming pool. Ensure that you follow the manufacturer’s instructions. Q: Does an outdoor pool use the same amount of salt as an indoor pool? A: No. Outdoor pools lose over 80% of their chlorine due to evaporation and sun’s UV rays. Indoor pools lose less chlorine and hence need less salt. Your pool needs to be clean and sanitized around the clock. Now you have an effective way to accomplish this without messing around with hazardous chemicals. 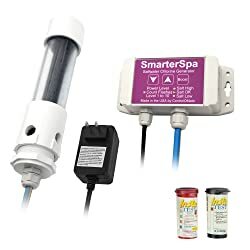 Get the best salt water chlorinator, such as the Pentair 520554 IntelliChlor IC20 Salt Chlorine Generator Cell, and save yourself money and hassle.